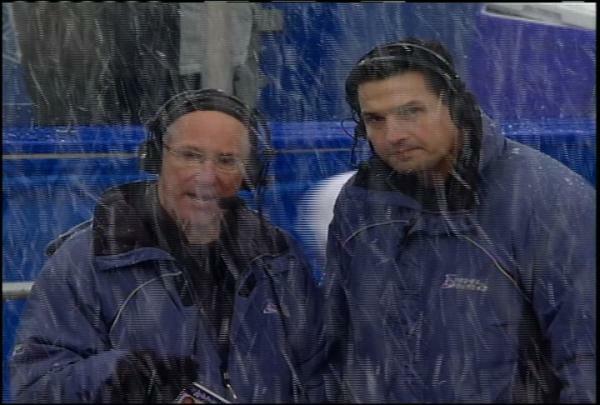 ...for advice on how to prepare for an outdoor hockey game than Mike Emrick? Darrin and I went to the Red Wings/Blackhawks outdoor game at Wrigley a few years back. It was flipping cold but it was well worth it. My suggestions: Lots of socks, layer, layer and layer some more and for crying out loud...wear a hat!!! I can't wait for Saturday, everyone travel safe and GO KOMETS!!! Wasn't that just a great story? I love the fact that his mom gave him his best advice (and don't moms always give out terrific advice)? As the holiday season continues to escape from our grasp, and as long as the Komets are in Toledo anyway, I'm hoping that the K's can package up a gift for Toledo. Or maybe, to be more specific, just to one of their players. No, I don't really mean anything to do with the outcome of the game but wouldn't it be nice, say, if Pistilli, Szydlowski, Ouellet, Perlini, Barteaux, or Beaupre would give one of their vowels to Toledo's (and the Czech Republic's) Frk. He's a fine right winger but he sure could use a "A","E", "I", "O", "U", and sometimes "Y"...and those guys have plenty to spare (heck, some of them are even "silent" and others have the sound of other vowels (ex. Barteaux and Beaupre). Could just as easily be Barto and Bopray. So, as they say in the Czech Republic, Hppy Nw Yr !! Kzoo fan here, wanted to pass on a few tips to K's fans as they make the trip to Toledo. Last weekend was simply awesome to sum it up best if you are a true hockey fan, the atmoshpere was second to none. The biggest draw back is the seating. DO NOT expect to have a good seat in the rink unless you are sitting in the upper deck. It was tough to follow the play from where the K-Wings fans were sitting but even walking around the concourse that seemed to be the only complaint. Get to Toledo early, take advantage of everything the city has to offer around the ball park and you will walk away with a big smile on your face and glade you were able to be a part of history! Thanks MOVR! Great advice. We are looking forward to all that the day has to offer, not just the hockey game!